Red, Green & Gold, these colors are nothing, if not festive! 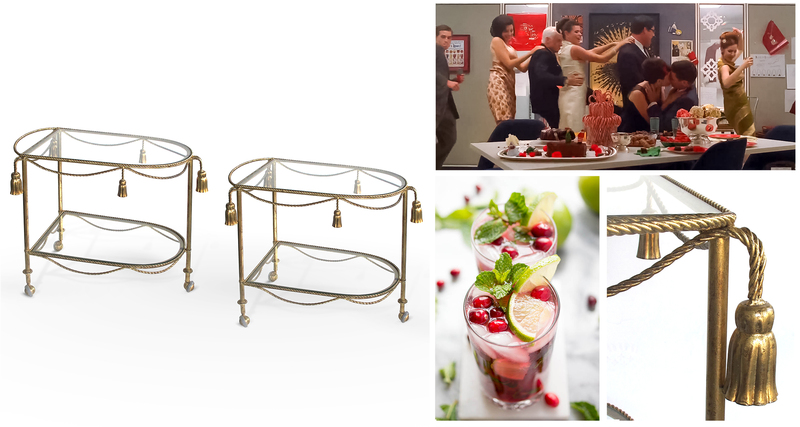 We draw on these definitive holiday hues for a most glamorous and celebratory soiree, Pomegranate and Cranberry Mojitos served on a PAIR of Glam Mid-century Hollywood Regency Bar Carts! First, A Chic Pair Of Italian Mid-century Hollywood Regency Gilt Tole Drinks/bar Carts With Glass Shelves Mid-century. Each gilt drinks cart with rope-twist frame adorned with swags and tassels; fitted with 2 glass shelves; excellent condition overall even wear height: 25 1/4" width: 30 1/4" depth: 18 3/4"
Now, pomegranate, cranberry and mint make for perfect party companions for this pair of plush mid-century Hollywood regency drinks carts! The Holiday Cranberry Pomegranate Mojito is made with fresh mint, cranberry reduction, pomegranate juice and fresh lime. This red and green holiday cocktail is super celebratory with added splashes of sparkling water give it a lively fizz for a fun holiday evening! To make festive Mojitos start with a cranberry reduction. Fresh cranberries are easy to find this time of year, so no excuses! Add sugar, water and cranberries to a small saucepan and simmer for 5 minutes until the cranberries burst and the sauce is very thick. Let the cranberry reduction cool. Use fresh cranberries. ( per l'utilizzo di succo di mirtillo invece di mirtilli freschi, è barare. No cheating! ) The cranberry reduction is what makes this cocktail! Perform this next step in front of your guests from these two stunning gilt bar carts! Muddle the mint and the lime together in each glass. Top with rum and pomegranate juice. Then, add some of the cooled cranberry reduction, ice and top with the sparkling water. Remember "Christmas Comes But Once a Year" - Make the most of it! And with any luck, your Holiday Party will rival the epic Madmen Holiday Office Party Conga Line here with Joan's red dress, leading the office conga line (We love all the cranberry and pomegranate reds in this clip, Madmen Season 4, episode 2, "Christmas Comes But Once a Year"!). Add sugar, water and fresh cranberries to a small saucepan. Simmer over low heat for about 5 minutes until the cranberries start to open up and the sauce gets very thick. Meanwhile, add mint and lime to each glass. Muddle together to extract the flavor of the mint. Need help styling your vintage bar carts? We defer to The Skinny Confidential & Lauryn Evarts as she styles her bar cart with fab vintage flair! "The Skinny Confidential favors a roll-around cart styled with color-coordinated spirits, mixers and bitters. What else is on her list of bar cart essentials? A vintage ice bucket, trendy coasters (a must have), and Champagne for the win!"